Qwik Print works with numerous local not-for-profit organizations. The Meaford Hall and Culture Foundation (MHCF) has initiated several fundraising projects and used print media as a primary promotion method. This has been in the form of large-format banners (4’ x 8’), coroplast signs, brochures and adhesive window signs. MHCF has developed a strong brand identity through their print materials, most of which have been designed by Joan Brown. 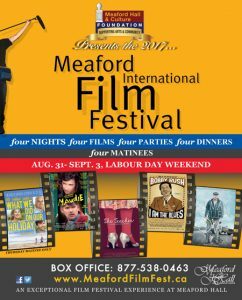 The Meaford International Film Festival is one of MHCF’s major fundraisers happening on the Labour Day Weekend. They have also created a customer rewards program with several Meaford merchants. Here is an overview of the organization’s mandate and activities. The Meaford Hall and Culture Foundation (MHCF) was registered in July 2006 and is a fully independent, not-for profit, charitable organization. It is governed by an independent, volunteer Board of eight Directors. The MHCF mission is to raise funds for Arts and Culture initiatives in the community. Included in these initiatives are monies raised for capital expenditures at Meaford Hall – like the recently completed balcony renovation and our Community Outreach program that funds bursaries, GBCS music and drama programs; amateur theatre; free admission for school children to theatre experiences and theatre and art camps. 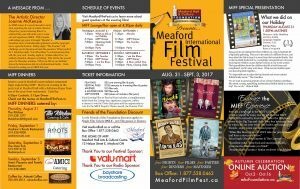 Our main fundraising activities include: MIFF (Meaford International Film Festival) www.meafordfilmfest.ca, silent auctions and the Friends program. Non-board member volunteers are recruited to help out with MIFF and the silent auction. We are very fortunate to have a very supportive community of sponsors and donors for these fund raisers. For more information about us, visit our website www.mhcfoundation.ca.